Paul Ryan has over 40 years and a wealth of technical experience in both the automotive and compressed air industries, which lead him to found his own company in 1993. Paul commenced working in the automotive trade in Dublin in the early 1970s. His technical experience started in Europa Cars, Dublin (Irish distributors for Mercedes, Audi and Volkswagen). During this period, Paul was involved with the mechanical, body shop repairs and parts departments. Paul travelled to Australia for a year in 1974 and spent some time working at Toyota. At the end of 1974, Paul returned to Ireland and worked with Harold Engineering, a leading supplier of automotive workshop equipment, air compressors, etc. After several years with Harold Engineering, Paul joined Atlas Copco an was involved in selling compressors to large industrial users. Paul also spent some time working for the Van Leeven Group in Dublin; supplying a wide range of automotive workshop equipment, brake testers, crash equipment and cylinder head reconditioning equipment. Following his time with the Van Leeven Group, Paul worked with the Sunested distributor in Ireland, supplying engine tuners, dynometers, hoists, etc. both in Ireland and Great Britain. 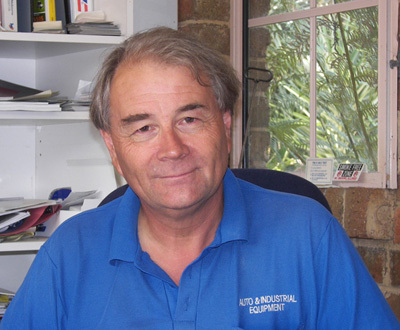 In 1986 Paul transferred to the Suntester distributor – AESC – in Australia: covering Victoria and New South Wales. Paul then worked with SAE in Melbourne supplying engine reconditioning equipment until 1993. In 1993, Paul founded his own company; Auto Industrial Equipment Pty Ltd, which supplies quality equipment and consumables to the automotive trade an general industry. Paul has been an associate member of the Institute of Motor Industry since 1989.